A paper for a component of my PhD work is finally in press (woo hoo!). I will put together a post about it once it’s uploaded to Sedimentology’s website. Before that though, I wanted to describe the general setting and show some photographs of my field area. 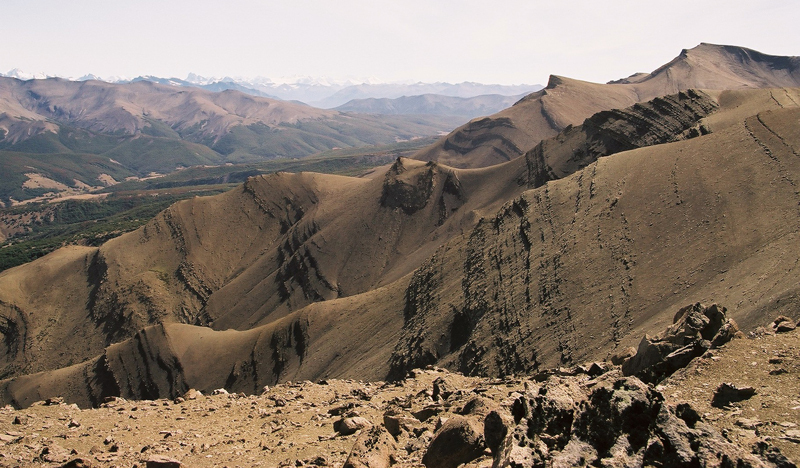 The paper is about a detailed outcrop study of deep-marine stratigraphy at a mountain called Cerro Divisadero in southern Chile. First, I will take you through a series of maps zooming in on the area. My worked was focused on sediments deposited in the latest Cretaceous (~75-65 million yrs ago). In the map above, you’ll need to “undo” the Scotia Plate and put the southern tip of South America and the northern tip of the Antarctic Peninsula back together. 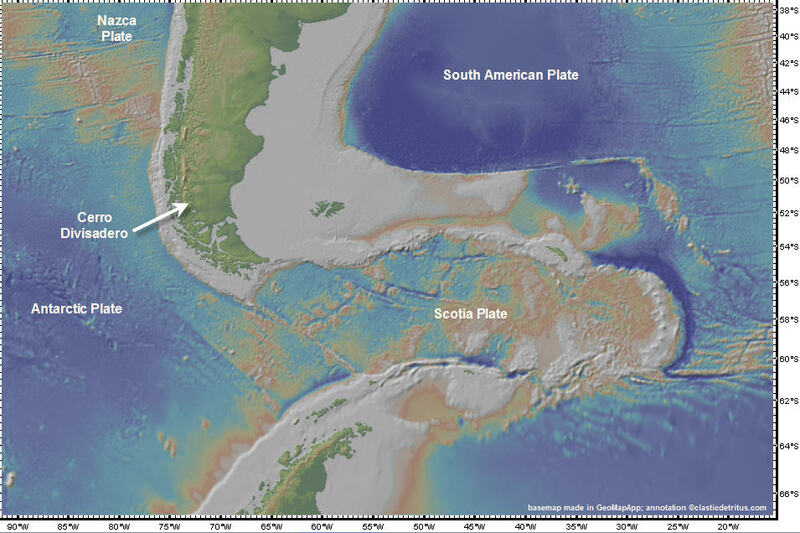 The timing and details of the development of the Scotia Plate and related tectonic features are, of course, much more complicated than that. But, for the purposes of this post we need not dwell on the post-Cretaceous tectonic evolution. Below is a paleographic map at around 66 Ma from the Paleomap project website. 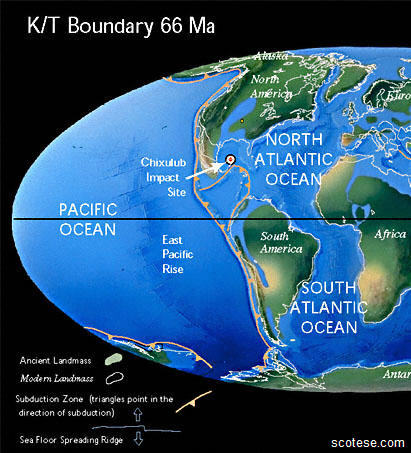 Look at the southern tip of South America and note that narrow north-south oriented marine basin. This basin is the Magallanes Basin (a retroarc foreland basin); also called the Austral Basin in Argentina. The Magallanes Basin was an elongate marine basin that widened and opened to the south. Eastward subduction and an associated eastward-propagating fold-thrust belt created an orogenic (i.e., mountain) belt. Foreland basins form adjacent to these mountain belts and end up collecting the clastic detritus shed off the mountains (another chapter of my PhD was investigating these larger-scale tectonic evolution with provenance analysis … I’ll post about at some point in the future). For this post, you need to picture a medium- to large-sized sediment dispersal system filling in that basin from north to south. As the deltas advanced basinward (southward) they fed a linked deep-marine slope system in which turbidity current deposits (i.e., turbidites) were deposited (see this simplified block diagram for a visualization, but note that that example is not a direct analog). 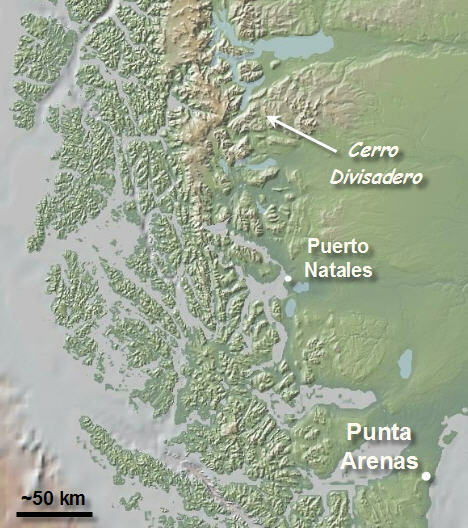 Okay, let’s zoom in a bit more … the map below shows the position of Cerro Divisadero relative to a Chilean town on the Straight of Magellan called Punta Arenas. This is the city most fly to when they visit Chilean Patagonia. For us, the journey from California would typically be something like: San Francisco -> Los Angeles -> Lima -> Santiago -> Puerto Montt -> Punta Arenas and would usually be a 20-hour journey when added up. From Punta Arenas, we would drive (~3 hours) to a much smaller town called Puerto Natales, which sits on the shores of the most inland position of the Seno Ultima Esperanza, which connects to the Pacific Ocean. Puerto Natales would be our “base” for 5-7 weeks each year – this is where we would buy food and other supplies (and get a shower) between excursions into different field sites. 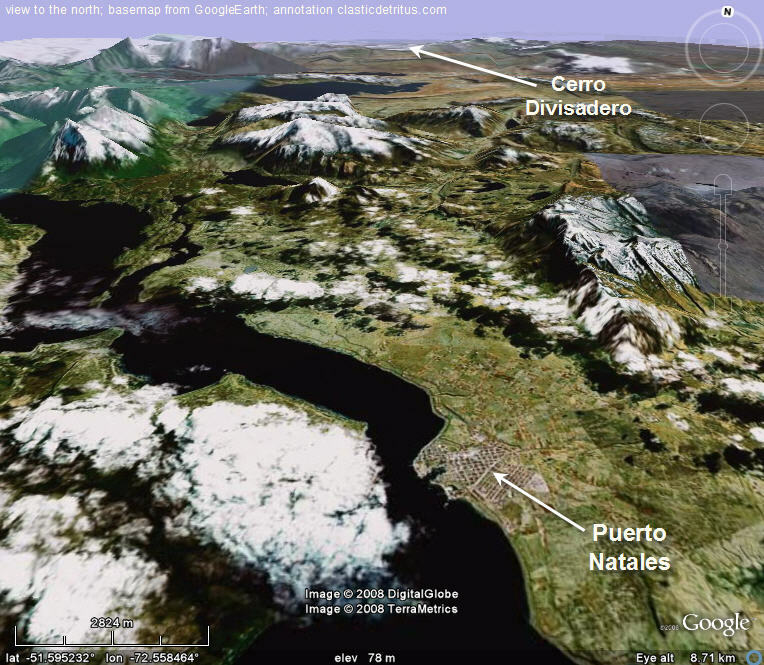 The next map below zooms in showing a perspective view to the north (from GoogleEarth) with Puerto Natales near the bottom of the image. Cerro Divisadero is in the distance to the north. Note the east-dipping strata on the right side of the image. That is part of this Upper Cretaceous outcrop belt that trends north-south (parallel to the Andean orogen). 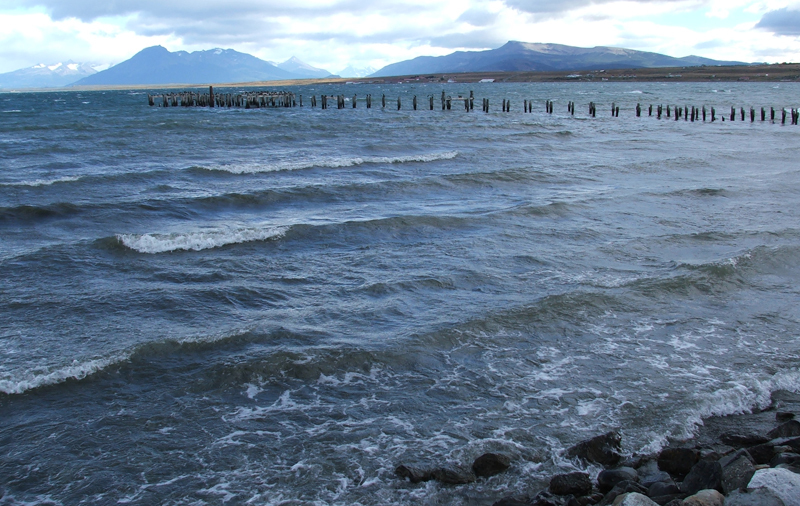 Before we head north to Cerro Divisadero, below is a photograph of the view from the Puerto Natales waterfront. Puerto Natales is a bustling little town in the summer … it is the closest town to one of the main attractions of Chilean Patagonia, Parque Nacional Torres del Paine. So, there was always a lot of backpackers/trekkers from around the world milling around town (mostly Europeans, Australians, Chileans from the north, and Americans). Unfortunately, after four field seasons I don’t have any photographs of the town itself … just rocks and scenery nearby. Doh! From Puerto Natales it is about a 2 1/2 hour drive to the confluence of two rivers, the Rio Zamora and Rio de los Chinas. 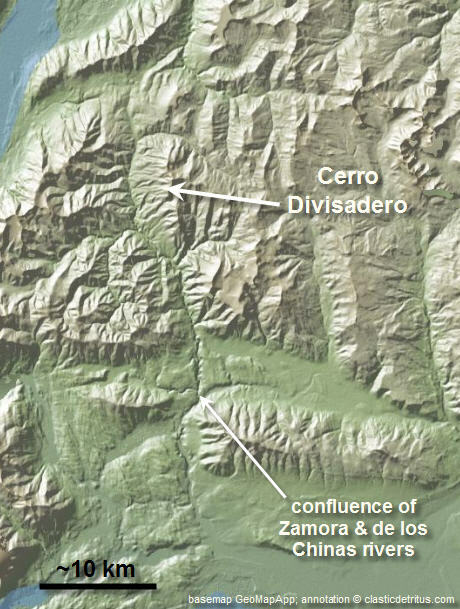 The map below shows another topographic map zoomed into that confluence and Cerro Divisadero. Alright, we’re getting closer but still not there. 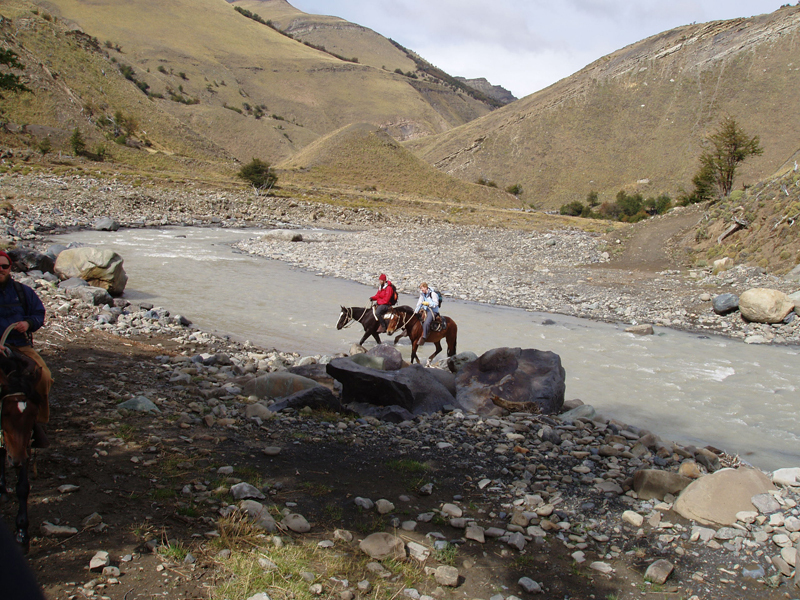 A few km north of the confluence, we would have to leave our vehicle and get on horseback. 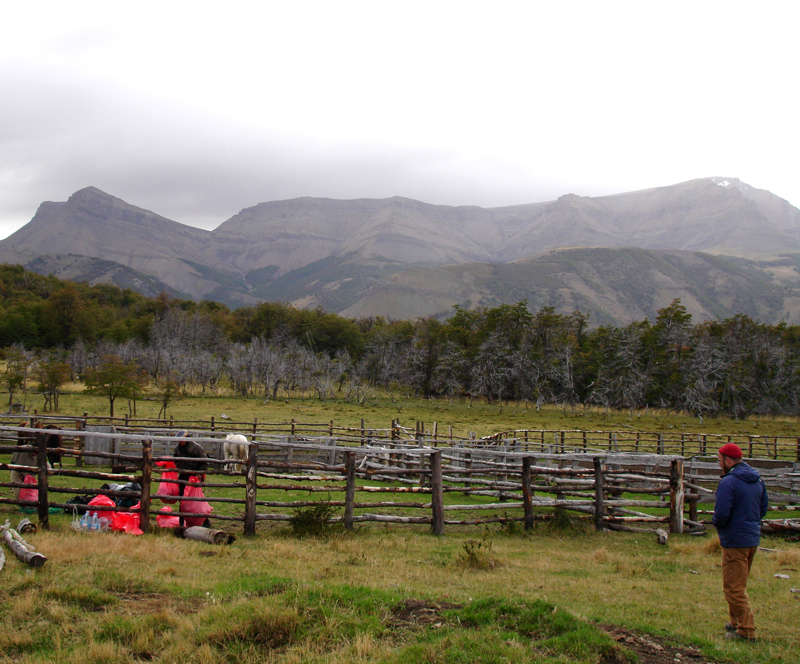 Below are some photos from an excursion to Divisadero in 2005 (four of us, four pack horses, and two gauchos). In the photo above that’s me looking on as the two gauchos we hired to take us to this site pack our gear into bags. These guys are experts at perfectly balancing out the load on the pack horses … we just needed to stay out of their way. Note the craptacular weather … not windy (for once), but drizzly and probably about 45 degrees Farenheit. The weather got better and better during this particular ride. Why did we have to take horses? The photo above is why – there’s an old road going right through that stream crossing. Nobody really uses the road anymore so, even if you could get across here without too much trouble (it’s quite low in this photo), the road is not maintained and there are several stretches that are impassable. Note the cute turbidite beds peeking out of cliff in the upper right. The horse journey takes 3-4 hours with a thrilling terrifying last hour or so that is cross country through patches of woods and steep gully crossings. That was always the time I felt a bit ‘old-school’ for a short time because we’d be trotting across the pampas looking up at the ridgeline and sharing observations about the geology. Although those moments of sepia-toned geo-romanticism would be interrupted every few minutes by feelings that I might perish at any moment due to the whims of a 700-pound animal. The gauchos would drop us and all our gear off and then head back to civilization (i.e., a ranch in the middle of nowhere). For this particular excursion, we were staying for 11 nights. Basically, we set up the date for them to come back and get us … and that’s how it worked (we had a sat phone in case we needed to get out earlier than planned). 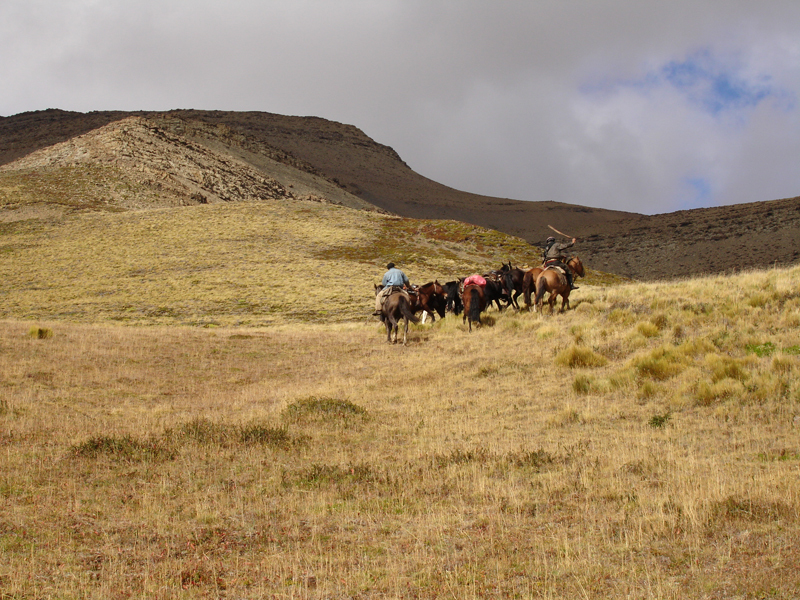 In the photo above, that’s Chechin and Luis riding off with all the horses … leaving the four of us … in the middle of nowhere … for 12 days. Finally! We’re there … after 20 hours of flying, a 3 hour drive to Natales, another 3 hour drive to meet the gauchos, and then 3-4 hours on horseback (and a lot of planning before and in between all these steps). The photo above shows our campsite. Although difficult to see in this photo the reason this spot was chosen is because there’s small ridge behind and to the right of the tents that effectively blocks the wind. 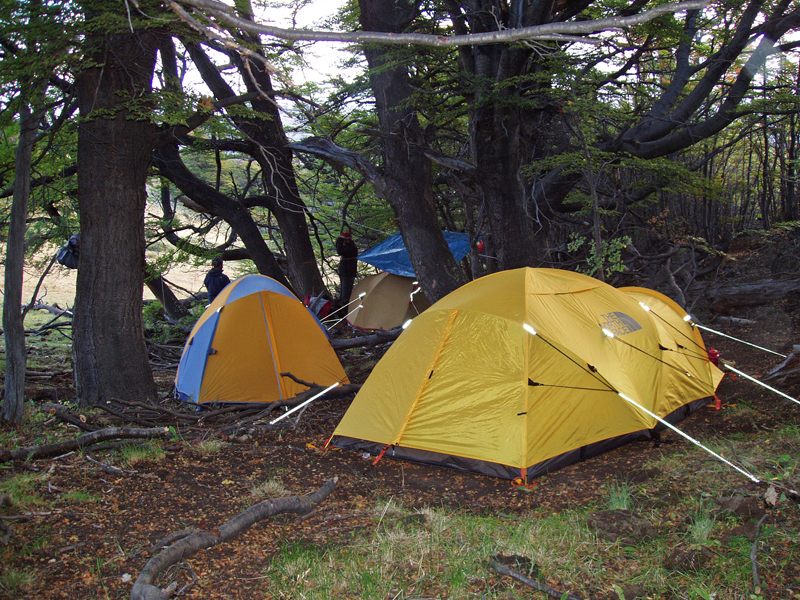 As many of you already know, Patagonia is ridiculously windy – finding a sheltered area to camp is crucial. The trees also provided a bit of extra cover for the rain and snow (although one trade-off is laying in your tent listening to the branches above creak and sway in the gusts of wind). The other key aspect of this spot is that it is only a 20-minute hike to the lowest outcrops (but a 2-hour hike to the top of the exposure). There’s something nice about living on the rocks you are studying. What about the geology? I will put together another post about that soon … but, to whet your appetite, here’s a photo from near the top of the Cerro Divisadero ridgeline. Nice post. It seems like a great place for field work. Silver Fox … this was a post I’ve had in a semi-complete draft stage for a long time, finally decided to finish it. Yes, the river has some glacial flour in it. Lab Lemming … indeed, it is more often than not far too windy for helicopters … there are certainly enough relatively calm days within a field season but it is very difficult to predict so one would have to rent a helicopter/pilot for many days and assume you might get only 1 or 2 good days … would be crazy expensive.